With 15 dining options onboard, passengers have plenty of dining options both day and night. The food aboard Norwegian Sun showcases a wide variety of quality, flavorful dishes no matter where you choose to dine. Those with dietary requirements, whether vegetarian or with certain ingredient aversions, will have no problem finding dishes to suit their needs. Check the Freestyle Daily to identify which outlets are open for breakfast, lunch and dinner each day as hours will vary. Diners planning to book multiple reservations at specialty venues should consider the Specialty Dining Package, which allows them to sample a variety of dining options for one set price ($69 per person for three-meal package, $84 per person for four-meal; plus 20 percent gratuity and specialty service charge.) (If purchased online in advance, you'll save $10 off the price.) Alcohol is not included in the price and additional entree charges may apply for dining at Cagney's Steakhouse and Le Bistro. Four Seasons Main Dining Room (Deck 5): The whimsical Four Seasons Restaurant has spirals on the carpet, pink curtains, etched floral designs and chandeliers, and twinkling lights overhead. The contemporary restaurant features a wide variety of menu selections that include five courses that change nightly and a list of wines by the glass or bottle that includes whites, roses and an extensive selection of reds from light to medium to full intensities, as well as North & South, Norwegian Cruise Line's handcrafted proprietary wines. Menus indicate which items are gluten-free and vegetarian options. Open for dinner only. Seven Seas Main Dining Room (Deck 5): Diners are greeted with stunning stained-glass artwork depicting the ocean's waves over the doors of the traditional-style Seven Seas Restaurant. Inside, the carpet and decorative glass dividers mimic the pattern of waves and the earth's continents as well. There's something for everyone on the menu, which changes daily and includes a wide variety of salads, soups and starters to eggs, burgers, sandwiches, entrees and some seriously delicious desserts. Menus change daily and include North & South, Norwegian Cruise Line's handcrafted proprietary wines. Soups and salads can be served as a starter or main course, and a garden salad, selection of sliced fruit, ice cream and sherbet are always available. Service is attentive with plenty of wait staff helping to get meals out quickly and as you ordered them. Open for breakfast and dinner as well as lunch on select days during each sailing. Garden Cafe (Deck 11): This busy Lido buffet area is often crowded and sometimes congested. However, it's worth the wait for the wide variety of dishes including several specialty items such as an omelet station at breakfast and made-to-order crepes at select meals. Lunch and dinner include a salad bar and fruit; main dishes of meat, potatoes and vegetables; tempting pastries and breads (including Norwegian's signature pretzel rolls); a pasta station and a variety of pizzas. For dinner, the Garden Cafe often boasts regional culinary themes from Cuban to Italian to Asian. You can order a drink from a server; grab a drink at one of several complimentary self-service beverage stations that include water, soda (only on drinks-included sailings), iced tea, juices, milk, coffee and tea; or bring an alcoholic beverage from a nearby bar. Garden Cafe is open often, including an early-riser buffet from 5:30 to 6:30 a.m., breakfast buffet from 6:30 to 10:30 a.m., lunch buffet from noon to 3:30 p.m., dinner buffet from 5:30 to 9:30 p.m. and late-night snacks from 9:30 p.m. to 1:30 a.m. You can also grab an ice cream here from 11:30 a.m. to 9:30 p.m. The Great Outdoors (Deck 11): Located all the way aft on Deck 11, past the Garden Cafe, this popular spot boasts an outdoor grill buffet for breakfasts of eggs, potatoes, fruit and hot cereal, plus cooked-to-order lunches and dinners of burgers, chicken, fries and more. There's a huge canopy providing lots of shaded tables in addition to other sunny seating overlooking amazing wake views. Don't be shy if you want to just grab a plate of fries and a drink from the accompanying Great Outdoors Bar. Typically open long hours for breakfast from 8 a.m. to noon., lunch from noon to 3:30 p.m., late-afternoon snack from 3:30 to 5:30 p.m. and dinner from 5:30 to 9:30 p.m. (weather permitting). Sports Bar (Deck 11): This classic sports bar serves up favorite bar foods from 5:30 p.m. to 5 a.m. including Buffalo wings, warm spinach and artichoke dip, burgers and fish 'n' chips while the surrounding big screens play sporting events. Adorned with lots of wood, dark leather seating and sports memorabilia, it's a fun spot for a casual meal. When food is not being served, you are welcome to bring your plate from the nearby Great Outdoors buffet and order an accompanying drink from the bar. 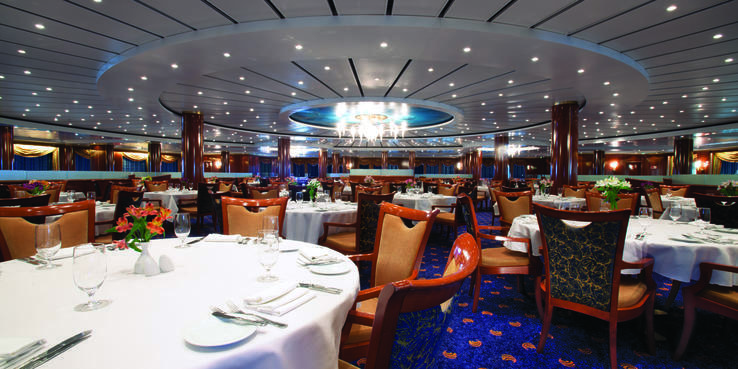 Moderno Churrascaria (Deck 11): Perhaps the ship's best-kept secret (although not actually a secret -- details are in the Freestyle Daily) is that Moderno is open on a complimentary basis for breakfast and lunch. Breakfast features a deluxe continental spread while lunch features a pizza and pasta station. It's a quieter just-as-delish alternative to the other buffets. Hours vary, but breakfast is typically 7 to 10:30 a.m. and lunch is noon to 2:30 p.m.
Room Service: Complimentary continental breakfast is available from 6:30 to 10 a.m. and can be ordered by placing the breakfast service door hanger on your stateroom door prior to 4 a.m. Continental menu items include fruit, yogurt, cold cereal, freshly baked pastries and beverages. La Cucina (Deck 5); a la carte pricing: This intimate Italian eatery boasts plenty of romantic ocean-view tables for two as well as plush, round oversized booths for larger parties. The menu features Italian specialties from antipastos and insalata to pizzas and pastas to chicken, meat and fish. Save room for an Italian dessert and after-dinner drink. Open for dinner. Moderno Churrascaria (Deck 11), $24.95: In the evening, Moderno transforms into a Brazilian churrascaria, where besides an extensive salad bar and traditional Brazilian sides like rice and black beans, yuca and more, skewers of slow-roasted premium cuts of meats (beef, pork, chicken and more) are carved tableside by experienced pasadores. Seafood dishes with shrimp and fish are also available. You're encouraged to dine at your own pace, just place the table marker green side up to keep the skewers coming, or switch to red to indicate you're ready for dessert. Wash it all down with a caipirinha, the national drink of Brazil. Open for dinner. Le Bistro (Deck 12); a la carte pricing: A fresh new look with a modern square design theme that starts at the glass entry door and continues to the tables and chairs as well as the carpet of blues and grays. Blue curtains flank floor-to-ceiling windows while a large standing wine cabinet faces the room. The menu features fine French cuisine from escargots and duck to bouillabaisse and traditional French ingredients like creams, a variety of cheeses and mushrooms. Open for dinner. Ginza Sushi (Deck 12); a la carte pricing: Book a table or grab a bright yellow seat at the sushi and sashimi bar and order your selections from the menu of fresh fish creations including nigiri, maki, temaki and specialty rolls. Open for dinner. Teppanyaki (Deck 12), $29.95: Two hibachi tables (with four grills total) are situated in a private room (next to Ginza Sushi) that features sleek, modern red and black furniture, lighting and tableware as well as geisha artwork. Signature cocktails and classic Japanese teppanyaki dinner selections are served by entertaining hibachi chefs who cook your meal in front of you on the large grill while showing off their knife and culinary skills along the way. Open for dinner at select seating times (5 p.m., 5:15 p.m., 7 p.m., 7:15 p.m., 9 p.m., 9:15 p.m.). Los Lobos Cantina (Deck 12); a la carte pricing: Added to Norwegian Sun during its 2018 dry dock, the line's popular Mexican restaurant offers a modern take on traditional favorites. Menu items include guacamole prepared tableside; tacos with grilled mahi mahi, pork or poblano peppers and corn; chicken or pork enchiladas; house specialties such as Veracruz-style red snapper, carne asada and spiced shrimp skewers and, of course, delicious handcrafted margaritas (try the spicy version!). Los Lobos Cantina features leather banquettes, dark wood tables and ranchero-style design accents like numerous colorful skull and bull masks lining the walls and brown leather booths and chairs with Mexican patterns. Open for dinner. Cagney's Steakhouse (Deck 12); a la carte pricing: Cagney's menu includes traditional American-style steakhouse specialties (serving premium Black Angus beef) whether you crave a 20-ounce porterhouse or an 8-ounce filet mignon. Also on offer are grilled garlic shrimp or sea bass and classic sides such as the signature Cagney fries with white truffle oil and Parmesan cheese, sauteed spinach or onion rings. Dessert brings choices including Oreo cheesecake, a macadamia nut ice cream sandwich or warm apple cardamom crisp. Linger long over dinner in this intimate setting with an attentive wait staff, a plentiful wine list and decor that boasts black and brown leather seating, porthole windows and carpeting that even resembles a cow pattern. Open for dinner for all passengers; also open for breakfast and lunch for select suite passengers. Room Service; $7.95: Breakfast specials include omelets and French toast, while an all-day menu (10 a.m. to 6:30 a.m.) includes soup, salads, fruit and cheese plates; sandwiches, pizza and entrees of pasta, chicken, steak and fish. A kids menu is also available with chicken fingers, grilled cheese sandwich, macaroni 'n' cheese and a peanut butter and jelly sandwich. Desserts such as cheesecake, strawberry pound cake and chocolate cake are also on offer. If you're in the mood to celebrate, a special occasion menu (11 a.m. to 11 p.m.) includes selections of cold hors d'oeuvres, a shrimp platter and international cheeses.